The RaceCapture app will launch the first time setup wizard. Go to your device's WiFi settings, and connect to the PodiumConnect WiFi access point. Note, the WiFi Access Point is open, with no password - you can set a password and encryption later under Setup. 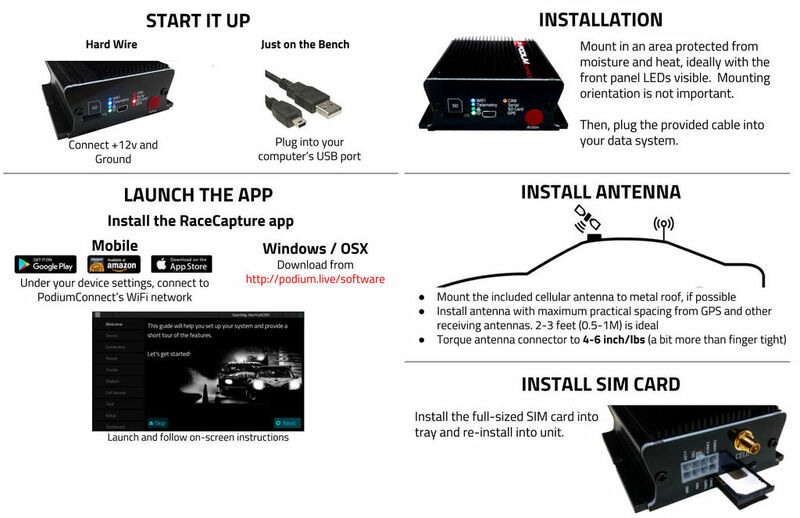 Select your device and verify the RaceCapture app connects. Select the preset configuration matching the data system you have. 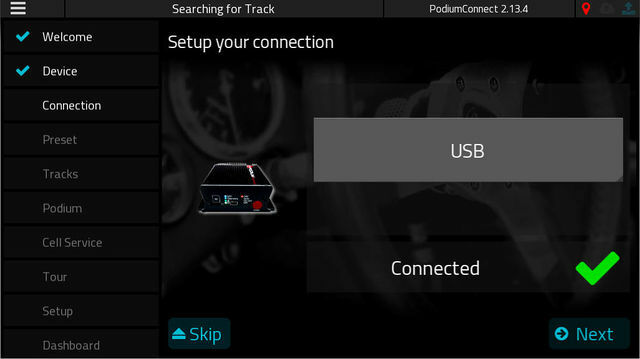 Select the tracks you will typically race at so PodiumConnect can detect the track location and calculate lap times. This is an important step to ensure you get valid data and lap times for your telemetry session. 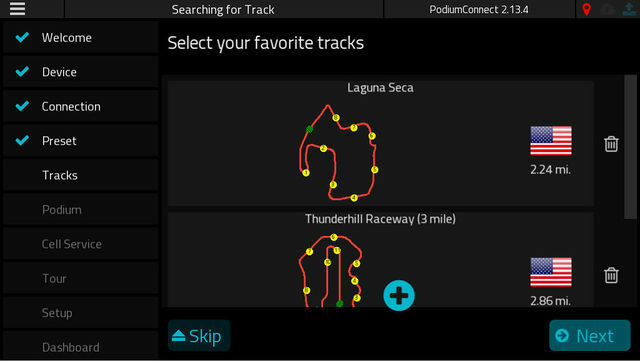 Note: Only select the one track configuration per race track, to ensure the correct track is auto-selected. If you don't see your track listed, please submit your track! 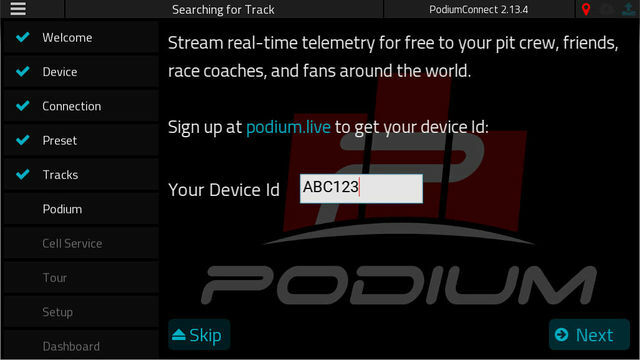 Create an account on Podium http://podium.live - then follow the steps to create a Device. Make a note of the Device ID provided, so you can enter it into the wizard. Enable the cellular connection and select your cellular provider. 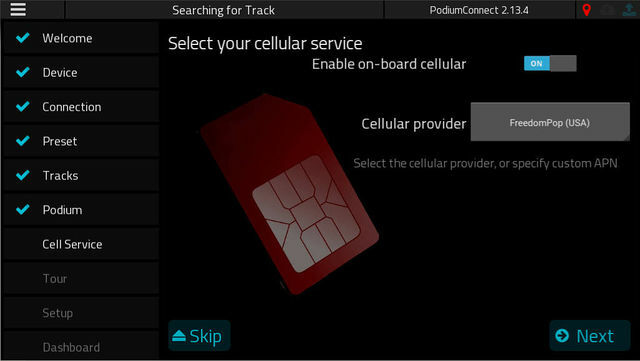 Note: If your cellular provider is not in the list, select the custom option and set the APN settings provided by your cellular carrier. The settings made in the first time setup can also be accessed via the Setup view of the RaceCapture app. Note To re-run the first time setup, launch the RaceCapture app without a connection to the device, go to the setup screen and press the First Time Setup button. 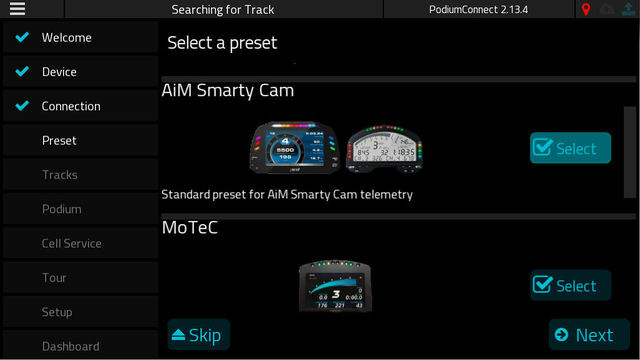 These channels allow PodiumConnect to calculate lap timing, which creates the context for analysing additional sensor data, such as temperatures, TPS, RPM, oil pressure and so on. Important: Without these channels, telemetry will not work properly. Use the provided integration cable and connect it to your data system. The main connector on PodiumConnect is a standard Molex MiniFit Jr connector. You may need to adjust or remove unused channels loaded by the preset. Navigate to Setup / CAN Mapping screen. Remove or adjust channels as appropriate. On the rear of the unit, pop the SIM card drawer out of the unit by pressing the ejector button with a ball point pen. Install the SIM card into the tray, with the gold contacts facing up. Slide the SIM card tray back into the drawer, ensuring you engage the drawer slot carefully. Press gently until the drawer seats. Power up PodiumConnect and attach the cellular antenna. Torque the antenna just beyond finger-tight (do not overtighten). 4-6 inch/lbs. Watch the telemetry LED on the front of the unit. When it begins to flash regularly, this means telemetry is broadcasting. Refresh this page when telemetry is broadcasting; you will see an Ad Hoc event listed. Click this link, which brings you to a page showing all devices at the event. (yours will be the only one). Click the name of your device. 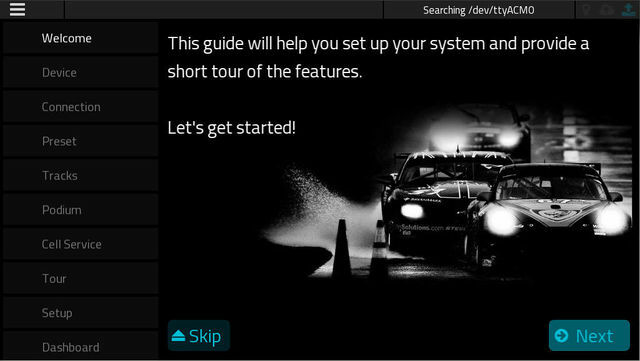 This will show the main race dashboard page. Here, you will see live data flowing from PodiumConnect. Note Mounting orientation does not matter. Install the cellular antenna on the roof of the vehicle in a location as far away from receiving antennas as reasonably possible - e.g. opposite side of the roof from the GPS antenna. Temporary alternative (reduced performance): You can also install the antenna to the windshield using a suction cup, or in the passenger compartment using zip ties, ensuring the antenna body of the antenna is 8" separated from metal structures. Visit the guide on using Podium, which includes a video tour of the essential features.